Student Loan Debt … how to incur as little as possible. Ashley, over at the Life Tastes Better on a Budget Blog has recently re-posted her article How to Graduate From College Debt Free. Since it’s high school graduation time and many young folks will be heading off to college, and many parents and grandparents will be sending their young folks to college , we thought it would be wise to share Ashley’s blog post. As most folks know, generally speaking, you can not wipe out, or discharge, student loan debt in bankruptcy. So now, more than ever, it’s important to incur as little student loan debt as possible. While it is impossible for most to not take out ANY student loans at all, by following Ashley’s guides, it is likely to that you can limit the amount that you do have to incur. Good luck to all the new graduates, and here’s hoping for a prosperous and debt free (as much as possible !) college experience for you all. We have provided links to her blog post throughout our Blog Post above, but you can also access her post by clicking here. In an interesting bankruptcy case from New York, the Court determined that a debt owed to a college was NOT a student loan for purposes of the bankruptcy law, and consequently, COULD be discharged in the debtor’s bankruptcy case. For an article discussing this case, click here. For the full case, click here. Normally, bankruptcy law does not allow the discharge of student loan debt, but this is a unique exception. As student loan debt is increasing and becoming more of a burden on folks, it appears more bankruptcy courts are exploring ways to allow debtors to discharge student loan debts. 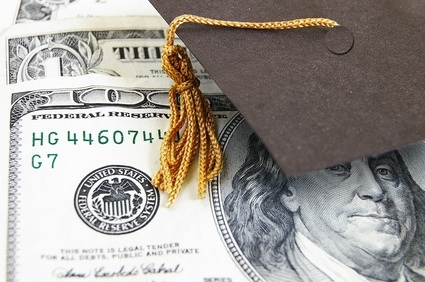 If you have student loan debt, you should not always assume there are not options available. There are law firms that specializing in helping folks with student loan debt. Can you be arrested for not paying your student loans ? But it’s not likely to happen to you. If you need help paying your student loans, contact an student loan or bankruptcy attorney immediately. Most will offer you a free consultation and help you look at your options to deal with your delinquent student loan debt. There are many ways to help. The most important thing is to not ignore your student loan debt. It will not go away. While being arrested and thrown in jail is not likely, you can still face wage and bank account garnishments, and seizures of your tax refunds. Will filing bankruptcy prevent me or my children from getting student loans in the future ? The Bankruptcy Code makes it illegal for government agencies to refuse student loans to those who have filed bankruptcy. 11 USC 525(c). So if you have filed bankruptcy, you are still eligible to receive student loans that are backed by the government (Title IV loans) such as the Stafford Loan. If you get a student loan from a private lender, that’s a different matter entirely. The Bankruptcy Code prohibits discrimination only from government agencies, not private lenders. Private lenders, such as banks, are under NO obligation to give you a student loan if you have filed bankruptcy or have other credit problems, but may still consider it. This doesn’t mean that you won’t be able to obtain a student loan from a private lender or bank if you have filed bankruptcy. It just means that private lenders are allowed to consider your credit history including bankruptcy filings in evaluating your student loan application. What are my options if I am worried about not being able to make payments on my Federal student loans? The area of student loan forbearance and forgiveness can be confusing and misleading if you rely on the internet to research your options. Thankfully, the new Consumer Financial Protection Bureau, also known as the CFPB, in Washington, DC offers a website to begin the process of dealing with student loans that are not current. The site, which can be accessed by clicking here, can cut through some of the confusing material and misleading information that you may find on the internet. As a government agency, the CFPB was set up with a specific mandate to help the average consumer deal with all the confusing myriad of options out there in the financial world. The CFPB was the brainchild of Senator Elizabeth Warren, who at the time was a professor at Harvard Law School, and a long time advocate of consumer rights for the public. This site can be a starting point for research and my message would be to not give up, as most of the time the student loan lenders, be they government or private, will offer you better options and terms than you currently have if you can demonstrate a financial need.